Weddings Costs > How Much Does It Cost to Dye Shoes? How Much Does It Cost to Dye Shoes? Dyeing a pair of shoes is often seen as a practical alternative to buying a new pair, especially when the shoes need to match an outfit made for a special occasion. This service is often used for weddings and other special events as a way to get a pair of shoes to match a dress perfectly. On average, a pair of shoes, whether leather or suede, can cost anywhere from as little as $10 to as much as $35 for rush orders. Shoes To Dye For & More in Natick, Massachusetts, offers shoe dyeing services for $12, according to their official website, and the process takes approximately six to 10 days. Rush jobs, where the shoes can be dyed in less than a week, will cost $25. Dye N Shoes Today in West Palm Beach, Florida, another professional we had found online, offers shoe dyeing services for $20 for a pair of shoes not bought through its store. Emergency dyeing services cost $35 plus the cost of shipping. DyeMyShoes.com in Somersworth, New Hampshire, offers shoe dyeing services for $17.50 a pair for continental US orders. The price does not include the cost of shipping the shoes to the company. Shoe dyeing companies, if you were to send in your shoes to someone online, often require customers to download and fill out an order form, send the pair of shoes to be dyed, along with the completed form and payment. When placing a job order for shoe dyeing online, customers will need to specify the color option, typically from a drop-down menu or from an array of colors. Or, they may also be required to send a sample of a material, such as a fabric swatch, so that the color can be matched to it. Typically, white satin and silk shoes are the types that can be dyed. If you don’t want to ship your shoes to an online company, most local shoe repair companies can dye your shoes for you. The price of the shoe dyeing service may or may not include the cost of shipping the shoes to and from the customer. The length of time it takes to finish the job may vary from one company to the next. The length of time required to finish a job can take seven days to as long as three weeks, depending on the service provider. With some companies, a shoe dyeing job can take up to 12 business days from receipt date, including shipping the shoes back to the customer, depending on the customer’s location. When sending the shoes to a shoe dyeing company, customers may need to pay for the cost of shipping the shoes to the company. At some companies, shipping can cost $45 for a next-day delivery for a single pair of shoes and about $19 for the 3-day air option. As stated above, rush orders are going to cost more than standard orders. Be sure to ask the service provider first if the shoes you want to be dyed can be dyed. Some companies will not claim responsibility for the cost of the return shipping of shoes that cannot be dyed. Generally, only white satin and silk shoes that are created to dyed can be dyed. 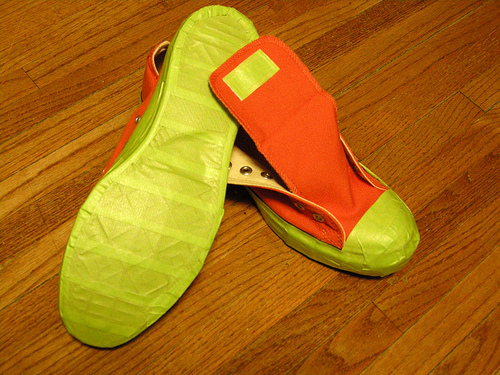 Shoes that come in a colored material cannot be dyed. Dyed shoes are not waterproof since shoe dye is usually manufactured from a water-soluble base. This means that when the shoes come in contact with water, they will likely run or bleed. If a pair of dyed shoes gets dirty, do not clean them. Instead, dye over them with a darker color. If not, apply a water-repellant spray on them. Shoe dyeing companies typically require customers to specify if the shoes will be worn at an indoor or outdoor event. Colors look different from indoor to outdoor/natural lighting. Changes in color are often unavoidable and occur because of different light settings, which are usually due to the fabric being dyed. Check for discounts offered on their website or social media page before purchasing. If you are not in a hurry to get back the pair of shoes sent for dyeing, choose the most affordable shipping option. It may take a while before the shoes are returned, but you can save on the costs of shipping. Do research on the various companies that offer shoe dyeing services. Choose one with the least expensive option that suits your preferences and requirements. If you do not mind being crafty on your own, consider dying the shoes yourself. Most supplies can be purchased for as little as $5 to $10. Top selling leather dye kits on Amazon, for example, retail for as little as $9.